Using The Revolutionary Command Adhesive, Command Decorative Hook Holds Strongly On A Variety Of Surfaces, Including Paint, Wood, Tile And More. It Also Comes Off Cleanly - No Holes, Marks, Sticky Residue Or Stains - So You Can Take Down And Move Your Command Hooks As Often As You Like. 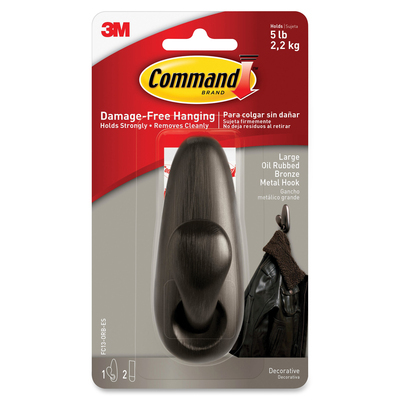 Reusing This Large Hook Is As Easy As Applying A Command Refill Strip (Sold Separately). That Means You Can Take Down, Move And Reuse It Again And Again. Classic Bronze Metal Hook Holds Up To 5 Lb. More From The Manufacturer.